By combining several varieties of colorful beans you can create an attractive dish with plenty of fiber, vitamins and minerals. 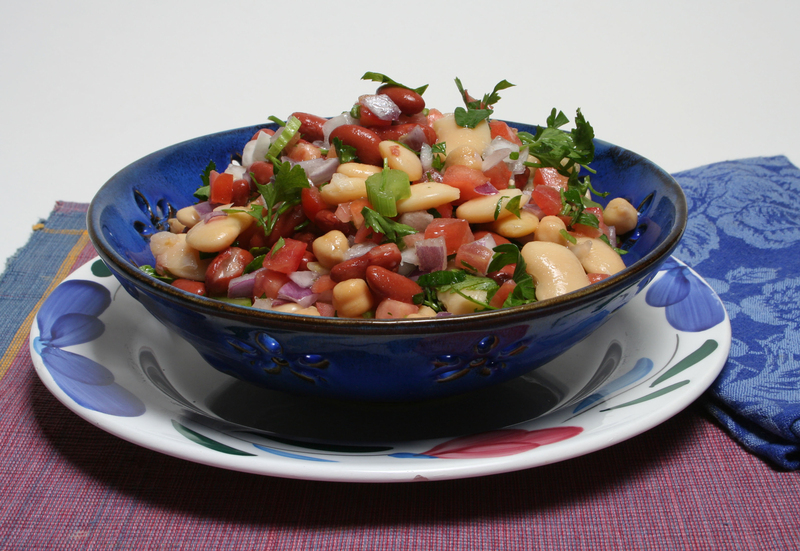 The kidney and garbanzo beans in this week’s recipe are familiar to many Americans, but it’s the less well-known butter beans that provide the earthy quality in this dish. Butter beans, popular in the southern United States, are a seed and considered a vegetable. There are two main varieties: the slightly curved flat green beans (often called lima beans) and the lighter colored ones called the sieva bean. Sieva is the butter bean referred to in Southern cuisine. Lima beans are thought to have been first cultivated in the South American Andes Mountains and the smaller sieva beans in Mexico. You can find fresh butter beans grown in the US from late spring into summer or in the frozen section when not in season. Mature butter beans are dried and available to prepare as you would other dry beans. So, forget any school cafeteria bias you may have against lima beans, because well-prepared butter beans have a rich flavor and smooth texture. The onion, celery, tomato, flavorful herbs and simple dressing of olive oil, vinegar and lemon make this a garden-fresh salad. You can pair it with a sandwich of cucumbers and thinly sliced avocado for an earthy and satisfying meal. Want something a little heartier? Serve with a cup of tomato soup. 9 g protein, 8 g dietary fiber, 228 mg sodium.